DThe F-3X compact is a versatile water resistant bag with easy access inner and outer compartments and plenty of space all around this is my go to bag when I want to travel light. I highly recommend that you pick up the shoulder pad while your at it as this will give you the comfort to use this bag all day without feeling any strain. The Domke J-1 is designed to handle the larger cameras and lenses favored by professional news photographers. It is made of water resistant double-ply ballistic nylon. 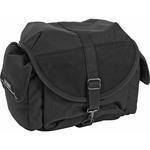 There are 14 compartments and pockets including an adjustable padded insert that can be configured to fit the camera and lenses, a fully lined main compartment, two large end pockets, and a zippered pocket that stores filters and various other things. This bag is a must for any weddings photographer. I carry everything I need for a full day wedding shoot in this bag, and it is my primary camera bag. Again we suggest you pick up the shoulder strap for added comfort and reduced strain. 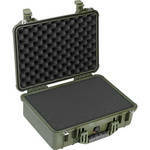 Pelican is the leader in durable cases for transporting the most sensitive of equipment. We use Pelican cases for traveling all over the world and I wouldn’t trust my equipment in anything else. With fully customizable foam inserts so everything is padded just how you want it. There is a reason the US Military relies solely on Pelican to protect their most valuable assets. From Pelican: The Pelican 1500 Case with Foam (Olive Drab Green) is an unbreakable, watertight, airtight, dust proof, chemical-resistant and corrosion-proof hard case used to carry any kind of equipment that needs to be protected from the elements. It is made of Ultra-High Impact structural copolymer that makes it extremely strong and durable. It has a 0.25" (6.4mm) neoprene o-ring, easy-open double throw latches that seal perfectly. It includes an automatic pressure equalization valve for quick equalization after changes in atmospheric pressure. It is carried by a folding rubber over-molded handle. We use this case to carry all our portable audio packs. 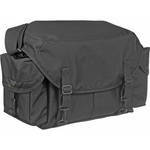 From Pelican: The Pelican 1510 Carry On Case with Foam (Olive Drab) is just like the 1500 except it's slightly larger and has wheels with a retractable handle. This is the largest TSA Carry on approved Pelican model you can purchase and we use these to transport all kinds of things. In fact, we just built one of these to carry our 5 Bay Drobo S and decided to check it rather than carry it on. The airline lost it, then it made 5 different connecting flights before making it to me 24 hrs later and half way around the world. The Pelican, and everything inside was COMPLETELY unharmed! Awesome.